Come on, Bill and Richard, join the political revolution! 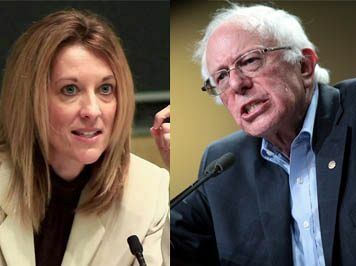 Bernie Sanders and Stephanie Kelton are strong role models for our own political leaders to follow, writes Dr Steven Hail. YOU MIGHT HAVE SEEN Professor Stephanie Kelton on ABC Breakfast or Planet America recently. Stephanie is a former Chief Economist on the Budget Committee of the U.S. Senate, something therefore of a Washington insider and was the main economist behind Bernie Sanders’s bid for the U.S. presidency in 2015-6. She was in Australia with Becky Bond, the chief organiser of the Sanders campaign and gave talks to packed halls in Sydney, Melbourne and Brisbane. Kelton’s message was a simple one. We face major challenges: climate change, inequality, economic insecurity, under-funded public services and so many more. We have a powerful tool to meet these challenges, which is the public purse, under the control of the Federal Government. Deficit spending is nothing of which to be scared and is often better thought of as a private sector surplus, rather than a government deficit. The Government is the sole manufacturer of the Australian dollar and can never run out of dollars. The constraint on spending – private sector and government – is inflation. Taxes are there to limit inflation, redistribute wealth, discourage some activities and encourage others, not to pay for government spending. The Government issues the currency, we use it. They are in a completely different position to us. The Government as a household metaphor is inaccurate, misleading and pernicious. Use of the public purse to help us meet our challenges will not be inflationary if we do not go beyond our productive capacity. We can eliminate involuntary unemployment, transform our energy system and build a more equitable society, given the political will to do so. What is technically possible can always be paid for. Every time I say these things, people instinctively respond with references to “money printing”, Zimbabwe or Germany in 1923 — always without having a detailed understanding of what are actually the drivers of inflation or the causes of those catastrophes. Even when I show people that governments like that of Australia usually run deficits and that government surpluses (as private deficits) drive the private sector into debt and absent a surplus on the current account of the balance of payments, are unsustainable for more than a few years, it is hard to shake off this response. Government surpluses lead to dangerous household debt, recessions or sometimes both. Some of us have been pointing this out for years, but it is very hard to get past the “government as household” myth. We have been making progress though, and Stephanie Kelton’s visit was a boost. More recently, she has been prominent among a long list of some of the world’s greatest progressive thinkers at an event organised by the Sanders Institute in Vermont, including a panel featuring, among others, Naomi Klein. Meanwhile, Sanders himself remains the most popular politician in the USA, having admitted he is thinking of running for president again in 2020 and, even at the age of 77, is right at the centre of an increasingly effective progressive movement in the U.S., both inside and outside the Democratic Party. Bernie talks of a political revolution and a Sanders presidency would bring genuinely transformational changes in the USA. Over in the UK, Jeremy Corbyn is offering something similar, albeit under different circumstances. Corbyn does not have the benefit of economic advisers of the calibre of Stephanie Kelton, in my opinion, and is hindered in policy development by trying to follow advice from economists used to operating within a neoliberal narrative based on what ought by now to be discredited neoclassical macroeconomics. I have less faith in a Corbyn Government successfully delivering lasting change than I would with a Sanders Presidency, notwithstanding Corbyn’s heart being in the right place. I am still hopeful, though. Both Kelton and the Australian economist Bill Mitchell have recently been to the UK and I am sure they would visit again for further discussions if they were called on to do so. There is certainly a lot of interest among Labour Party members in their ideas. Over here in Australia, I’ve recently had the chance to engage – sometimes directly and sometimes indirectly – with a variety of politicians, trade union leaders and others. Be in no doubt, they are aware of the Kelton visit. She is a big name. Moreover, members in more than one of our parties have been putting pressure on them to become more ambitious in developing a genuinely progressive agenda — a Green New Deal, you might say. And yet, I can’t say I have been very effective myself. The story for me in Australia has often been an enthusiastic reception from the rank and file, but not from the experienced, perhaps cynical, battle-hardened professionals at the top of these organisations. They have lived their lives in a neoliberal frame for so long that they seem reluctant to imagine something else is possible. When asked questions about policy, I try to use the same framing and make the same recommendations as Stephanie Kelton. Use fiscal deficits in the public purpose. Introduce a job guarantee. Develop a Green New Deal, with a rapid transition to a low carbon economy. Re-regulate the banks and other financial institutions. Act to reduce inequality. Fund public services properly. The response is often a shocked silence. Or sometimes, “I can’t say that”. Or, occasionally, someone will mention the Overton window. And then I think perhaps I should have been more incremental. Just advocate for a small, local trial of a job guarantee, maybe. Or perhaps just an emissions trading scheme along the lines proposed by the Gillard Government. Something small, something they can live with, something that won’t scare anyone, that the markets will like and that they can say while pretending they will keep the government budget in surplus (which they won’t do anyway, or not for long and, as I have said, is a foolish aspiration in any case). What do I wish for? A Bernie Sanders figure. An inspirational political leader of the progressive Left, who is ready to talk of revolutionary changes, to advocate for them, to explain why they are necessary and why our current path cannot be sustained for very long. Australia needs a political revolution, not incrementalism. A rapid shift from the financialised, unequal, ecologically unsustainable and irresponsible, insecure economy of today to a sustainable, equitable, inclusive future. Right now, Bill Shorten and Richard di Natale are offering us different forms of incrementalism. I understand their reasons — a mix of world-weariness, fear of the media, in Shorten’s case a conviction the country will fall into his lap and in Di Natale’s case a fear the Greens could easily lose their seat at the parliamentary table if they take too many risks. I would like to challenge them both. Do a Bernie Sanders. Offer us a political revolution. Inspire us to build a better Australia and a better world. If either of you would like to speak with Stephanie Kelton to get some ideas about how you might achieve this and you haven’t yet made contact, I would be happy to put you in touch. Or you might just pick up the phone and talk to our own Bill Mitchell. You could even talk to me, and I will channel Mitchell and Kelton for you.